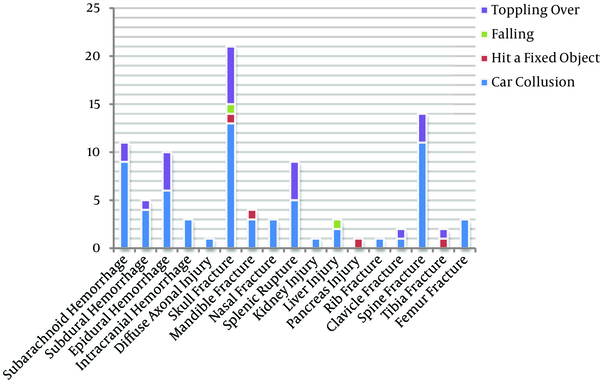 To Cite: Shams Vahdati S, Rajaei Ghafouri R, Razavi S, Mazouchian H. Bicycle-Related Injuries Presenting to Tabriz Imam Reza Hospital, Iran, Trauma Mon. 2016 ; 21(2):e20856. doi: 10.5812/traumamon.20856. Background: Rising fuel cost and subsequent increase in transportation prices encourage people to use cheap transportation such as a bicycle. This vehicle can also be used for sports and recreation. Bicycles are widely used in Iran, like other countries. There is not enough data about bicycle-related traumas in our country. Objectives: The aim of this study was to obtain the epidemiology of this type of injury in Tabriz Imam Reza Hospital as a referral center in northwest of Iran during 2009 to 2012. Materials and Methods: One hundred bicycle-related patients during the three years were entered in this descriptive cross-sectional study. Patient’s demographics, place and time of crash, mechanism of trauma, helmet and other safety device usage, and disposition information were gathered by a researcher-made checklist. Admission rate and ward as well as the site of injuries were also collected. The data were analyzed by SPSS 16 software using descriptive statistics. Results: All the patients were males with a mean age of 31.3 ± 23.12. Seventy six bicycle-related injuries occurred during weekdays and 24 happened on holidays; 71 patients attended the emergency department in the morning and 29 at night. Only three of 100 cyclists had helmets during the accident. The rates of injuries were as follows: 65 head and face, 20 abdomen, 14 chest, 11 soft tissue, eight lower limb, eight cervical spine, six upper limb, four thoracic and lumbar spine, and three pelvis injuries. Conclusions: Head and face are the most common sites of injury and skull fracture is the most common one. Considering the preventable entity of trauma, the use of helmets seems to be beneficial to prevent most bicycle-related injuries. Cycling as a healthy and cheap transportation method is socially accepted all around the world; especially, because of the increasing cost of fuel and dearth of natural resources, people have an inclination toward cycling. The risk of injury in cyclists is more than other vehicle riders through lack of protection in bicycle (1-3). Every year, nearly 1,000 people die from bicycle crashes and 550 000 cyclists are treated in emergency departments worldwide (4). Head trauma is the most common injury among cyclists. Sixty five percent of head trauma fatalities occur in cyclists younger than 15 years of age (4, 5). In Wang’s study, 27.8% of cyclists had head trauma and young boys between 5 - 9 years of age consisted most of the casualties. However, Hefney et al. obtained different results (6, 7). The incidence of head trauma among their study population was 73.9% and none of the casualties had helmets. Eid et al. reported that the mean age of cycling casualties was 16.1 ± 13.7 years in their study. They also found out that the most common injury was lower limb trauma (44%) (8). In Depritere’s study, nearly half of bicycle crash causes were collision with motor vehicles; after that falling was rife (9). There are no rudimentary cycling rules and cycling paths in Iran. Despite these limitations, lots of people ride bicycles for commuting, enjoyment, exercise, or as a sport every day. Considering the lack of enough infrastructures for cycling and the individuals’ unawareness about proper using of bicycle, it seems that type of injuries are different in Iran in comparison with other countries. Knowing the demographic distribution of bicycle casualties, causes and mechanisms of injuries can help us to prevent mishaps. The aim of this study was to investigate incidence, mechanism, distribution and consequences of cycling casualties among trauma patients, treated at the emergency department of Tabriz Imam Reza hospital as a referral center in northwest of Iran. This descriptive cross-sectional study was conducted in the emergency department of Tabriz Imam Reza hospital from April 2009 to April 2012. Sampling method was census and the data of all the patients with bicycle-related injuries in this period were collected. Patients with incomplete medical recordings or those who were discharged before the completion of the treatment process were excluded from the study. Data gathering tool was a researcher-made checklist which included patient’s demographics, place and time of crash, cycling purposes, mechanism of trauma, helmet and other safety device usage, and disposition (8 am to 8 pm was defined as day and 8 pm to 8 am was defined as night). The time of admission was partitioned to holidays and weekdays as well. Fridays and public off-days were defined as holidays. The site of injury, patient’s diagnosis in the emergency department, their admission in various wards and mortality were included in the questionnaire. Reliability of questionnaires was approved by expert opinion method and validation using the statistical package for social sciences (SPSS) version 16.0 and Cronbach’s alpha coefficient was calculated as 0.86. The data were entered into SPSS and analysis was performed using descriptive statistics (mean ± standard deviation, percentage, etc.). To assess P value, independent samples T test was used. Between April 1, 2009 and March 31, 2012, 100 patients attended the emergency department of a Tabriz Imam Reza hospital with bicycle-related injuries. Of those, 60 were cycling for transportation purposes, 39 for exercise or recreation, and one for shipping. All the patients were males with a mean age of 31.3 ± 23.12 years. The age ranged from 4 to 83 (Figure 1). Of all the patients, 61 were single and 39 were married. Seventy six bicycle-related injuries occurred during weekdays and 24on holidays; 71 patients attended the Emergency Department in the morning (8 am - 7.59 pm) and 29 at night (8 pm - 7.59 am) (Figure 2). Thirty one of crashes only involved one bicycle: four patients fell off from bicycle, 24 toppled over and three hit with fixed objects; 69 patients were struck by a motor vehicle in roads or highways; four cyclists crashed in highways, 77 in roads, 16 in alleyways, one in sidewalks and two in their own houses. Only three of 100 cyclists had helmets during the accident. Of these three patients, one had pelvic trauma without fracture or internal organ damage and was discharged from the emergency department without need for treatment. Two had a skull fracture and splenic rupture. One of them was admitted in the general surgery ward and another one in the general surgery intensive care unit (ICU). Five subjects wore knee sleeves and just two of them used elbow sleeves. Seventy patients were admitted, but 30 of them were discharged home from the emergency department. There was no significant relationship between admission and patients’ age (P = 0.41). 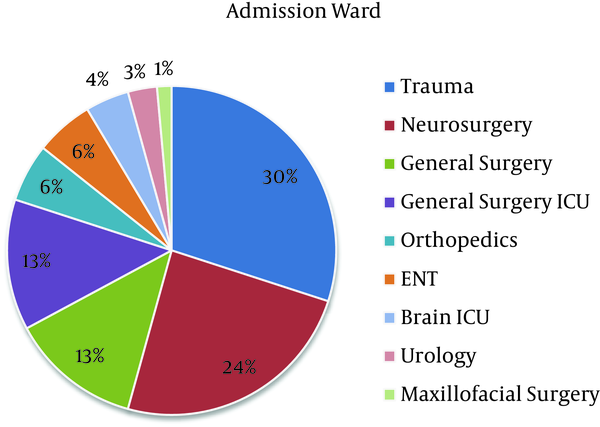 Most of admitted patients were hospitalized in the trauma ward (30%) (Figure 3). Most sustained injuries involved head and face (65%) followed by abdomen (20%) and chest (14%) (Table 1). Most patients were diagnosed with skull (21%) and spine (14%) fractures at the Emergency Department (Figure 4). Only three patients died because of severe injuries. In our study, 100 patients were admitted to the emergency department of Tabriz Imam Reza hospital during three years. In a study in the United Arab Emirates, 200 patients were admitted with bicycle-related injuries (8). In another study in Hong Kong, even more patients had this type of injury during one year (698 people) (10). The low number of bicycle-related injuries in our study revealed the reluctance of people to ride bikes. Iran does not have bike paths; thus, riding bikes can lead to even greater risks, because of using highways and roads for cycling. In Eid’s study the male to female ratio was 7:1 and in Yeung’s study, 34.5% of patients were females; but all of our patients were males (8-10). Since in Iran women are not allowed to ride in public places, interested women have bikes at their own houses. Those who cycle at home are less vulnerable for injuries; so, they comprised only 2% of victims in our study. 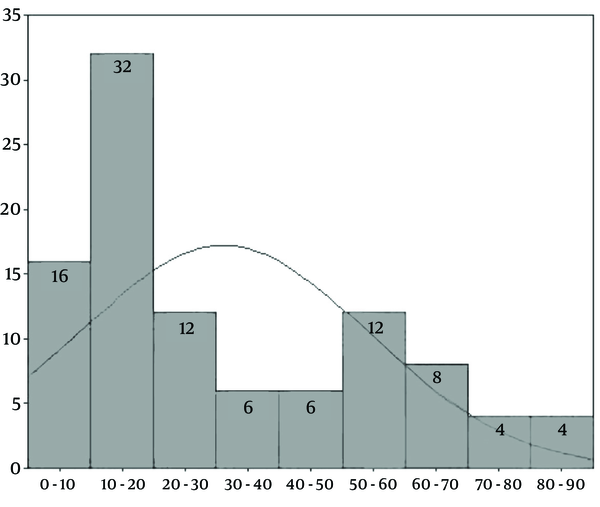 Although the mean age of patients was 31.3 ± 23.12, most of them were at the age group of 10 - 20 years (32%). Four patients were at the age group of 80 - 90 years. It shows that cycling is socially accepted in different ages in Iran. The mean age of patients in the study of Gomei et al. was 47.1 ± 27.4, which was significantly higher than our study (11). Although one day of week is holiday in Iran, 24% of accidents occurred on holidays. It shows the extensive use of bicycle during holidays. This ratio was almost constant throughout the year, but the accident rate was higher in March holidays (54.5%). This could be due to the fact that Iranian new year holidays (Noruoz) are in this month. 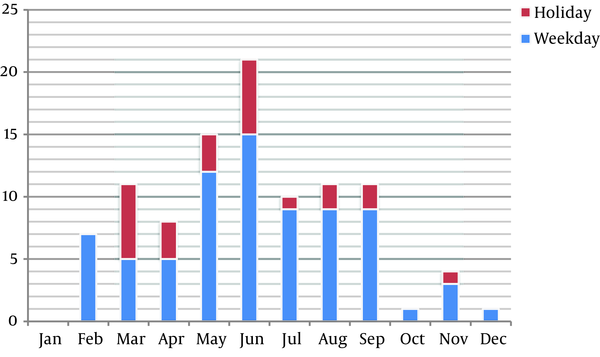 The numbers of accidents were more in spring and summer in proportion to fall and winter (76:24). Although streets are slippery in winter and fall and cyclists are more vulnerable than other seasons, the large number of accidents in spring and summer can be due to greater use of bicycle in this period. According to world health organization, using helmets can decrease 20% - 45% of motorcycle fatalities (12). In addition, 25% of road accident injuries are head traumas. Cook et al. also reported that helmet usage could prevent 60% of head injuries; 3% of our patients wore helmets. Another interesting finding was that two of the patients who had helmets had skull fractures and it is not clear why! It can be caused by lack of information about the method of using helmets, using low quality helmets, etc. Since head and face injuries are the most common types of injuries and skull fractures, helmet usages can prevent most of bicycle-related injuries. Educating people to use suitable helmets properly is also necessary. Building bike paths also seems to prevent some of the injuries and may increase rider safety. We express our gratitude to Ahmad Zirak, MSc student of applied linguistics in Azerbaijan Shahid Madani University for his careful and precious guidance which was extremely valuable. Authors’ Contribution: Study concept and design: Rouzbeh Rajaei Ghafouri, Samad Shams Vahdati; analysis and interpretation of data: Hossein Mazouchianh and Sajjad Razavi; drafting of the manuscript: Hossein Mazouchianh; critical revision of the manuscript for important intellectual content: Samad Shams Vahdati; statistical analysis: Hossein Mazouchianh, Sajjad Razavi. Funding/Support: This study was supported in part by a grant from the student research committee of Tabriz University of Medical Sciences.